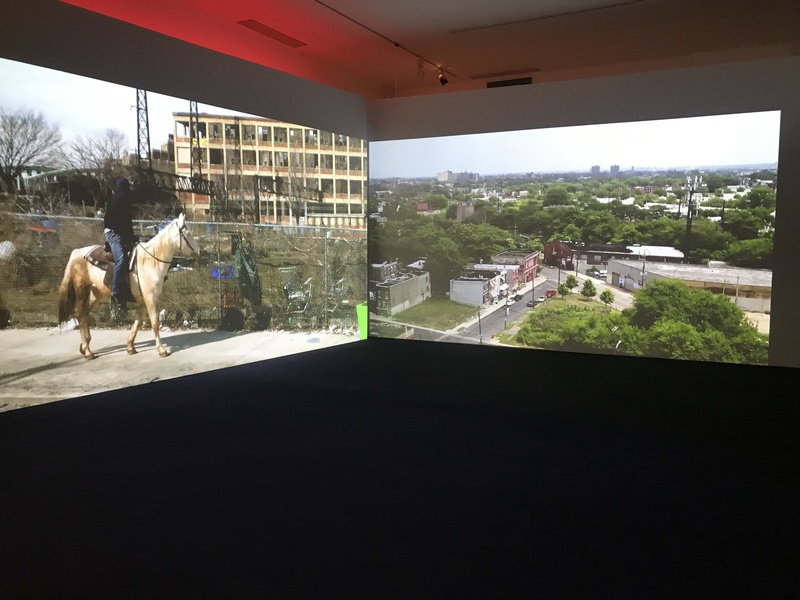 The exhibit titled ‘Urban Riders’ by artist Mohamad Bourassia, revolves around the movie ‘Horse Day’ filmed in Strawberry Mansion, Philadelphia. For 8 months, Bourassia was profoundly interested in the non-profit riding club founded by Afro-American riders in the early 1900’s. It is a place for young adults to express themselves, and a refuge for horses saved from harm and slaughter. Bourassia’s aim was to produce a platform to produce a ‘Contemporary Western’ within the city that Strawberry Mansion is in. 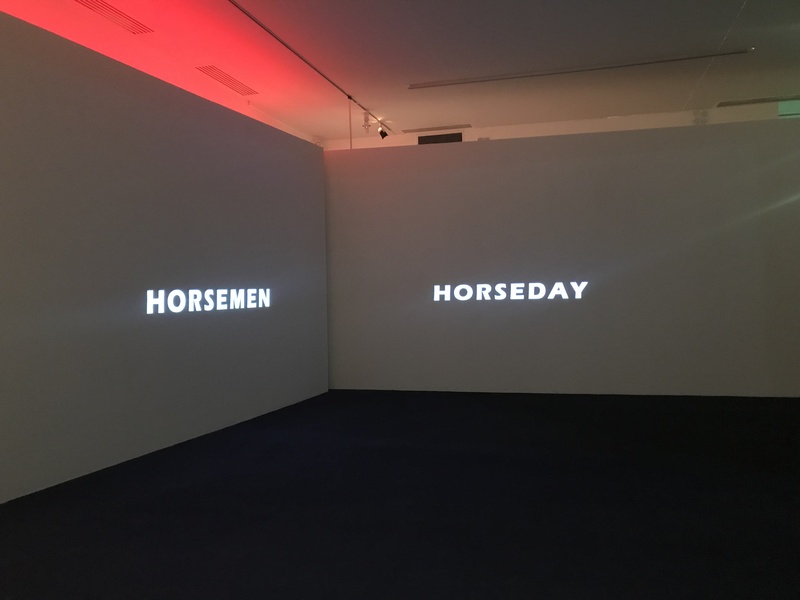 After his stay for 8 months, he decided to create an event called ‘HorseDay’ which was inspired by the act of car tuning. He invited artists to take part in this event and produce costumes for the horses. He therefore create a condition for sharing and exchange, which what the film is about. The film was set up on two sides, on a 90 degree wall angle in a dark room. There were very few seats facing a side, and opposed to another. On the left side was the preparation aspect of the vent ‘HorseDay’ put in place my Bourassia and other artists. However, on the right side was the actual day in which the event took place: Riders jumping through obstacles and the horse’s costume were on display. Personally, I thought the idea of projecting the movie similarly to how Bourassia did was very fascinating, yet confusing. Therefore, I would keep the idea of the two movies (1-Proces and making of the event; 2- The event itself) split into two. However, I would have them projected onto the same wall, yet opposite to one another, for the audience to better grasp the difference between the two projections. Attached below are photographs that demonstrate in a clear way the setting in which the two Films were projected.